Home > Beauty, Wellness and Sports > Beauty > [TOUCHE Elite] It’s your month ladies! [TOUCHE Elite] It’s your month ladies! It’s your month ladies! 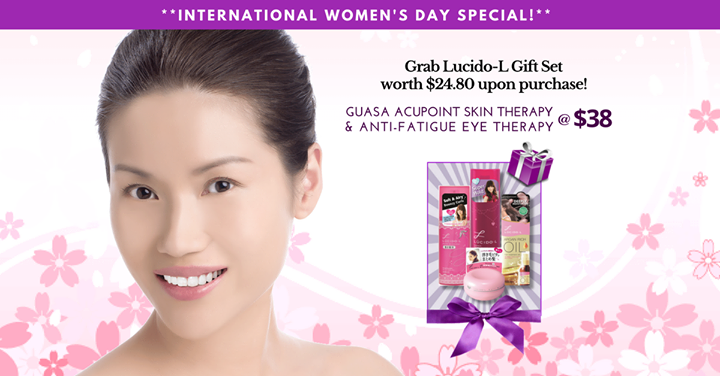 Celebrate International Women’s Day this March, with the proven GUASA Acupoint beauty remedy that promotes your inner health wellness from within. Experience improved vitality & optimum beauty rejuvenation in one single session at only $38! Plus! Only for the 1st 25! Receive a Lucido-L gift set worth $24.80 upon purchase! Click the link below to find out more now! *While stocks last! Terms & conditions apply. Previous: [CHICKEN UP] Melon or Watermelon? Next: [Babies’R’Us] Calling all Superheroes!